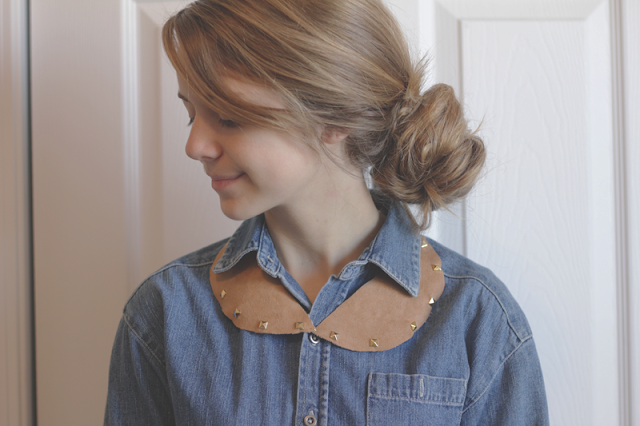 I can not begin to tell you how simple these collars were to make! The best part is I had all the materials on hand. 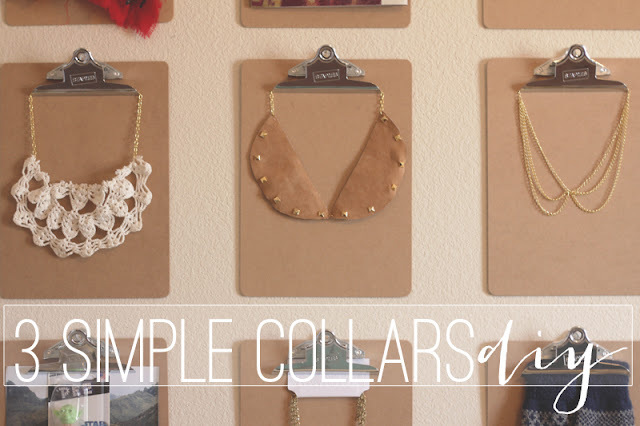 These quick collars are sure to be your next statement piece. Chain Chain Chain Collar: 1. 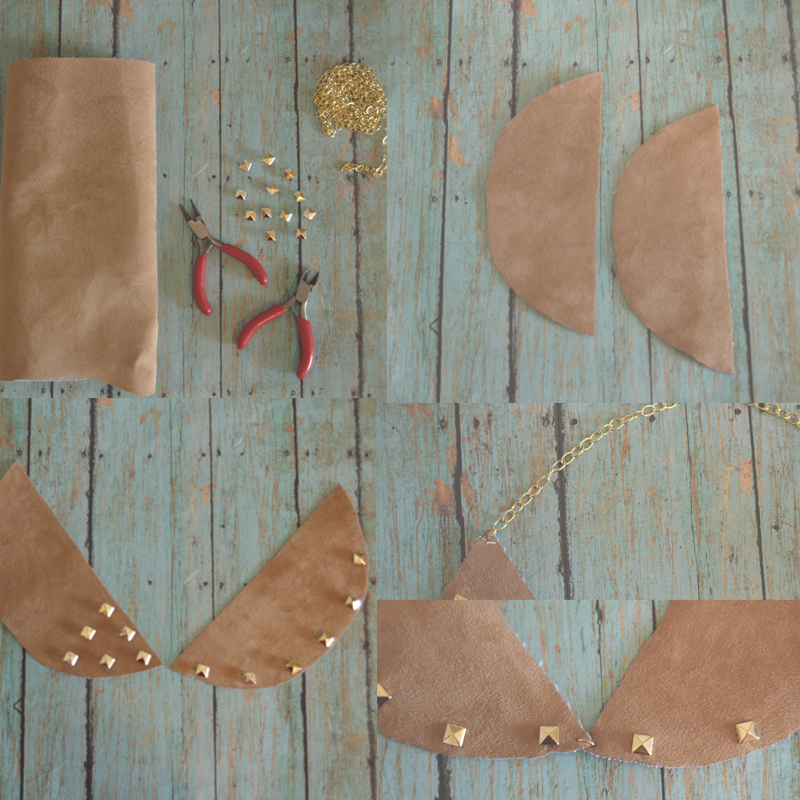 Materials Needed: Gold chain, gold clasp, round nose pliers, regular jewelry pliers. 2. 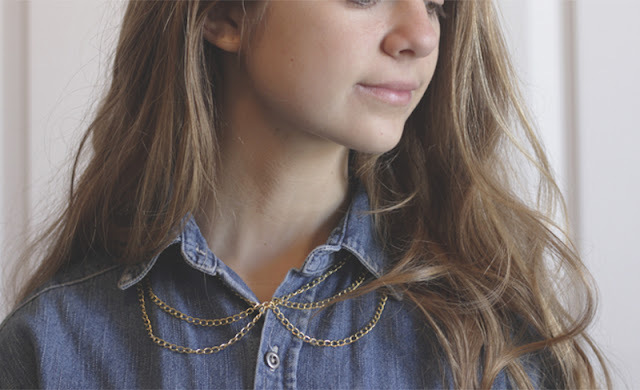 Take a long strip of chain and measure around your neck, cut to the desired length and add a clasp in the middle. 3. Cut two chains and connect at the bottom of the necklace then at the top, this will make the original collar shape. 4. Cut two shorter chain lengths and repeat step 3. You can repeat this as many times as you want adding multiple strips of chains. Doily Collar Necklace: 1. 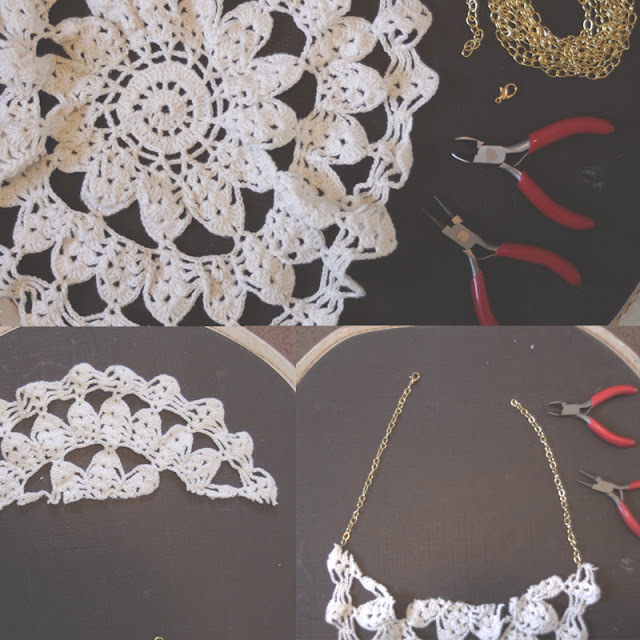 Materials needed: Crochet doily, Gold chain, Gold Clasp, Round nose pliers, Regular jewelry pliers, needle & thread 2. 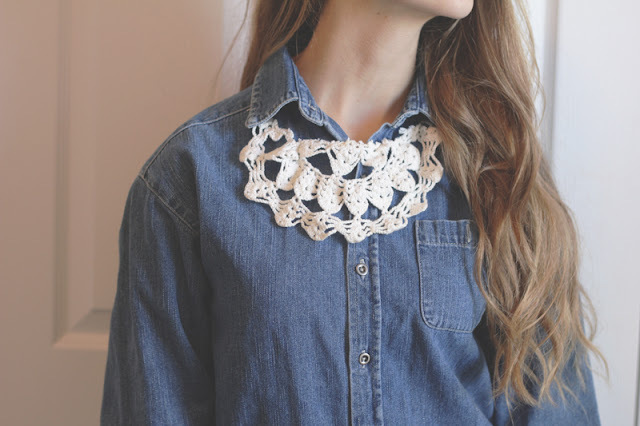 Cut Doily in half, after cutting you can trim it down to make it the desired size. 3. 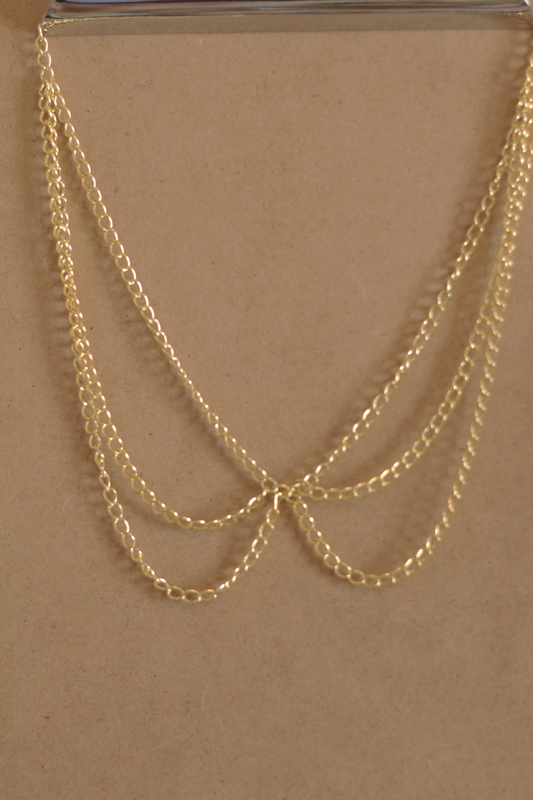 Attach chain to both sides of doily, measure to length you want and add jewelry clasp in the middle. 4. *NOT PICTURED go back over top of doily to secure loose ends and make smooth with needle and thread if desired. 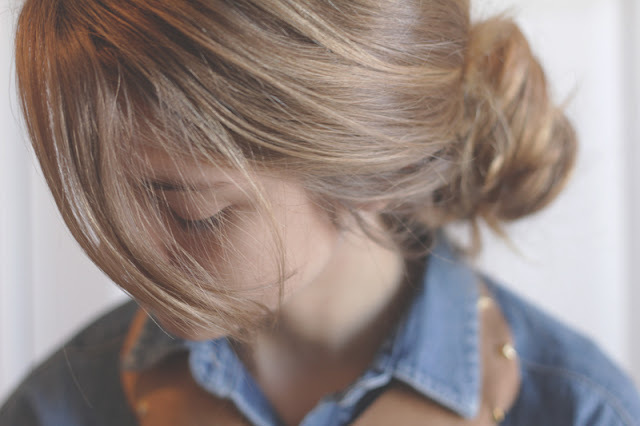 Studded Collar 1. Materials needed: Scrap seude leather, gold studs, gold chain, gold clasp, round point pliers, regular jewelry pliers, yarn needle 2. Cut 2 half circles out of leather (or cut a circle then cut in half) 3. Arrange studs to your liking. I tried out two different designs. Poke studs through fabric and secure on opposite side. 4. With a thick yarn needle, poke a hole at each corner of the leather, where the two halves connect add a link of chain. At the top of the half circles add the rest of the chain and then connect with a clasp. 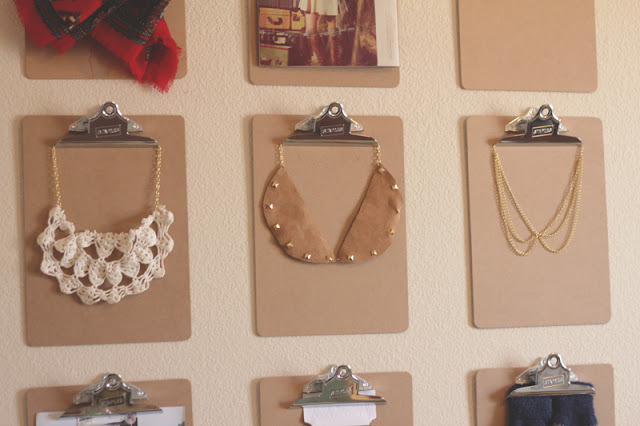 Each collar took me about ten minutes, this is a great project for gifts or when you feel like you need something new to wear the next day! I made the chain chain chain collar one night before bed which got my mind rollin with ideas for other collars. holy cats!! these are awesome and I adore the chain one, so pretty! gotta try these out.